I can finally show my first finish for 2010. 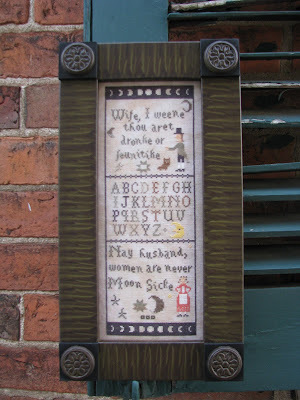 I just saw it on the ABC Stitch Therapy website (which is where I stole the picture from). It's the model I stitched for Lisa (The Primitve Needle) in January. The Primitive Needle "Cape Cod's Boys"
And here is the model I stitched for Lisa in December. The Primitive Needle "Moon Sicke"
Aren't they cool?? They are both going to be released at the market in Nashville later in the month. Well, I'm still stitching away on block 2 of CaHRH - I have everything done but the peacock now. Write soon! Thanks so much for stitching them Nicole!! Your stitching really puts mine to shame!! Two great pieces! You'll have block two of CaHRH done in no time. Beautiful, Nicole!! Both the designs and your stitching. :) I can't wait to do Cape Cod's Boys! How sweet; a companion to CC Girls! :D Thanks for sharing! Will the models you stitched come back to you after they make the show circuit and etc? Those are really !! I have Cape Cod Girls to stitch but now will have to get Cape Cod Boys too! You did a really great job on all of the models Nicole!! Oh how cool is that!? 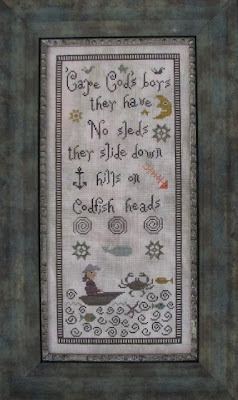 I'd love to stitch Cape Cod Boys...which means I have to stitch the CC Girls too! Great model stitching! They are great pieces! oh my nicole how cool! i love the designs but now that i know they're stitched by you i love them even more :) congrats on your beautiful first finishes of the year! I love Lisa's designs!! And your stitching is beautiful! They're fantastic, Nicole! You did a great job on them! They're beautiful designs, beautifully stitched! I plant to acquire CC Boys. Great stitching Nicole! These designs are great!! I love watching your progress on CaHRH..can't wait to see it finished and framed! Stop by my blog when you get the opportunity...love to have you visit! So cool Nicole! I can't wait to see your finished CaHRH! I have really enjoyed watching your progress! I thought your Paradise Lost was done...can't wait to see more progress! Wow, cool indeed! They're both wonderful and beautiful stitching by you, Nicole. Do you at least get to keep the patterns? Very beautiful!! I have a question for you. I can not mail you in private, so i ask them here. How do you stitch? In a hoop, or by hand? Do you make a cross at once, or do make half stitches right and them come back left? And what kind of hoop? Perhaps a foto makes it al clear? I stitch on lakeside for the first time now and i found it difficult to do. I useally stitch with no hoop and i do a ful stitch at once, but with the lakeside it does not work. I hope you understand what i'm talking about. Gorgeous, Nicole! Lisa is a designing whiz and your model stitching really show off her pieces. Congrats on both beautiful finishes. They are great. I am so excited to see your fianl finish on CaHRH I have really enjoyed your progress on this. Do you have plans on stitching their newest design? I love it. Yay! Thanks for sharing your finish! I'm sorry you don't get to keep them!